Are you looking to replace that old worn out cover? Then we have the solution for you. Our Cover Duplication process is going to not only save you time but also a lot of money. We send you the estimate* for a new safety cover. If you are happy with the price and want to purchase we can either ship you a box or come pick it up**. They ship the new cover and hardware directly to your home, you save Hundreds on your new pool cover! * Price may change once it is received by the manufactures base on specialty items such as extra padding or higher sqft. ** Delivery charges my apply based on your location, call for prices. A standard mesh cover is the only type of cover available 10+ years ago, so if you have an existing cover that is getting old it is probably in this category. These covers do a great job of keeping out leaves and larger debris while blocking about most of the sunlight. All manufacturers offer some type of higher grade mesh safety cover and this is the type of cover we recommend. What makes them advanced is the dense weave of the fabric, make it 98% sun blocking while still allowing water to pass through. These types of covers are slightly heavier, and cost more as well, but we feel the benefits far out way the cost. A solid cover with a drain panel is a great choice is you have a geometric pool such as a oval or rectangle. We do recommend a drain panel in all of our solid covers and will not put them on pools with strange shapes (they tend to hold water and cause puddling on the cover). They do a great job blocking 100% of sunlight and keeping out dirt and debris. They tend to be a little heavier but with today’s materials this is not a problem. 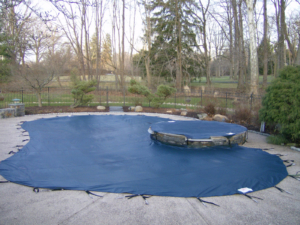 For more information on our swimming pool covers, visit our sister site at Unique Pool Covers.